Is your tweed jacket in need of a new accomplice? We've found your next culprit. 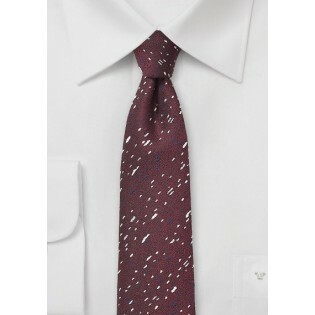 This BlackBird skinny tie in dark red is a perfect match for your tweet sport coats and jackets. The blended wool fabric gives it a thicker texture that makes it perfect for the outfits of winter. 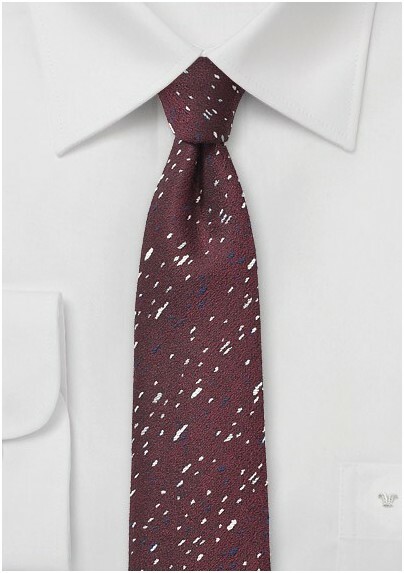 The burgundy is accented by specks in midnight blue and white, which make it a one of a kind design. Pair it with a chambray or linen light blue shirt. Cut at a slim 2.75 inches wide. Made from a blended silk and wool fabric.